The Razer Huntsman Elite is a keyboard we have been eyeing since Razer unveiled it at E3 2018. At a glance, we were intrigued by its appearance alone. Razer Chroma lighting not only illuminates the keys, as you would expect, but also the sides of the keyboard as well as the wrist rest. However, as cool as that may sound, it is not even the meat and potatoes of the Razer Huntsman Elite keyboard. This keyboard uses Razer’s new Opto-Mechanical Switches, where infrared beams are used to detect actuation at the speed of light. A new switch concept with already interesting lighting options begged us to check this keyboard out. Let’s dive into the Razer Huntsman Elite. The Razer Huntsman Elite is a full QWERTY keyboard, complete with a NumPad and dedicated media buttons. Aiming to be a keyboard that goes beyond gaming, all of the keys, including the media keys and volume dial, can be repurposed as needed. The keyboard also sports 10-key rollover, supporting the transmission of up to 10 simultaneous keypresses, ensuring that even your fastest and most-involved key presses do not cost you any missed actions in game. All of these keys are housed in a solid aluminum top plate, which teams well with generous rubberized feet on the bottom to lead to a nice and stabilized gaming experience. As mentioned before, customizable LED lighting surrounds the sides of the Razer Huntsman Elite. The included removable wrist rest can continue that wraparound of Razer Chroma lighting, when attached magnetically to the keyboard. However, you will need to use up an extra USB port if you want to power up the wrist rest’s LED’s to bring in that additional flair. The keyboard does not have any pass-through ports, so the second connection is solely dedicated to lighting up the wrist rest. This is optional, of course, since you can always use the rest with the LED’s off or take it out of the equation entirely. As for the new Opto-Mechanical Switches, the Razer Huntsman Elite keyboard aims to give you the feel of linear switches that actuate 30 percent faster than traditional switches. The Opto-Mechanical Switches use infrared beams within each key to detect key presses at a 1.5mm actuation point. The drive here is to detect actuation at the speed of light, while still giving the user the same tactile feel of Razer Green switches, which sport an actuation force of 45g. Each key houses a metal key stabilizer bar and is rated for a lifespan of up to 100 million keystrokes, thanks to the lack of physical contact at the point of optical actuation. With this, the keyboard aims to promote a longer lifespan than keyboards that face natural switch degradation from physical actuation. As far as build goes, the Razer Huntsman Elite is a sleek and solid piece of hardware that looks as good as it feels. Razer Chroma lighting shines sharply, brightly and cleanly. Through Razer Synaspe, and as with many of today’s gaming keyboards, you can always adjust the brightness and intensity of the LED’s. However, the LED’s were always a welcomed addition as they were not overwhelming even on the brightest setting. The leatherette cushioning on the wrist rest felt quite comfortable while giving you that reassuring feeling that you are using a quality product. Thanks to that magnetic connectivity with the keyboard and rubberized feet of its own, the wrist rest felt 100% stable and secure, whether it being throughout typing or gaming. I found the surrounding LED’s to be simply too cool for me to live without, causing me to sacrifice a USB port. However, having to use up an extra USB port without having a pass-through port was a bit of a chin-scratcher for me. I could only guess that the inclusion of a pass-through port would have bumped up the price of the overall product, so I found myself simply shrugging it off. Most importantly, the Opto-Mechanical Switches feel and type like a dream. I personally prefer a bit more resistance in my mechanical switches, and the Opto-Mechanical Switches have very little resistance. However, these switches actually changed my stance somewhat on light vs heavy key presses. Typing felt very light while returning quite satisfying clicks. With this feather-like resistance, actuation felt on point, regardless of which part of the key cap I pressed. You can thank the linear switch design backed by those key stabilizers for that. It was quite refreshing that key presses and actuation stayed consistent throughout the even more frantic key-press scenarios. The last thing you want on your mind during rapid key-presses is the sensation of wobbly or un-centered keys that you just happened to press at an angle. The Razer Huntsman Elite showed instantaneous responsiveness from when I typed to the action on screen. 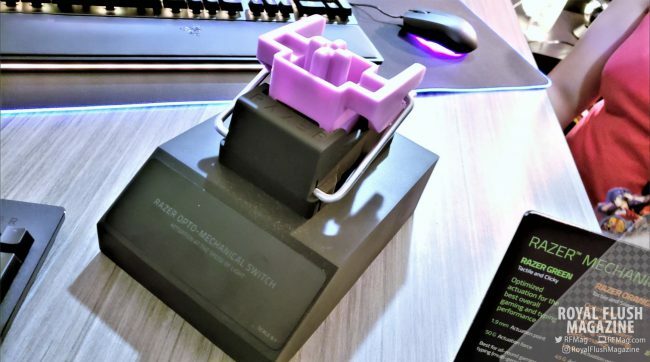 Just as important, the Opto-Mechanical Switches complete with stabilizers helped maintain a level of confidence that the Razer Huntsman Elite was ready to keep up with my fastest and wackiest key-presses. If you are hopping from non-linear to linear switches for the first time in a long time, there will be a slight learning curve for you to rebuild that muscle memory. However, once you are past that, the Razer Huntsman Elite is ready to take you far, comfortably and in style.